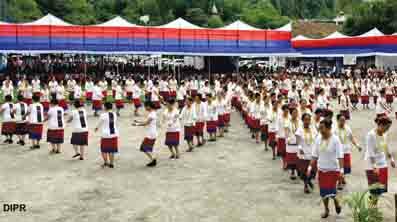 It was no stopping for the Apatani community of Itanagar who celebrated Dree festival with traditional pomp and fervour at the Dree ground on Thursday braving heavy downpour. Greeting the tribe on the festive occasion, Deputy Chief Minister Chowna Mein extolled the Apatanis’ zeal in preserving their age-old culture and tradition. “We have many things to learn from Apatani brothers, right from cultivating techniques to forest conservation culture. Ziro valley is truly a pride of Arunachal,” the Deputy Chief Minister said, citing renowned chef Vikas Khanna’s flattering description of his recent visit to the valley. Mein urged the Apatanis to lead from the front in the socio-economic arena and take other backward communities along. He also said that the State Government is putting efforts to ensure early recognition of Ziro valley as a world heritage site. Former Chief Minister Nabam Tuki, who was among the participants, also greeted the Apatani tribe on the occasion, and acknowledged its contribution in areas of human resource development and education. He said Ziro valley has led in several areas, such as cultivation, cleanliness, forest conservation, and cultural tourism, and encouraged the tribe to continue contributing to state-building. A skit depicting the Dree mythology and how the tribe’s ancestors started cultivating rice was the centre of attraction. The presentation of Daminda dance also added lusture to the colourful festival.